Discussion in 'Some Assembly Required' started by Hondo, Jun 14, 2013. 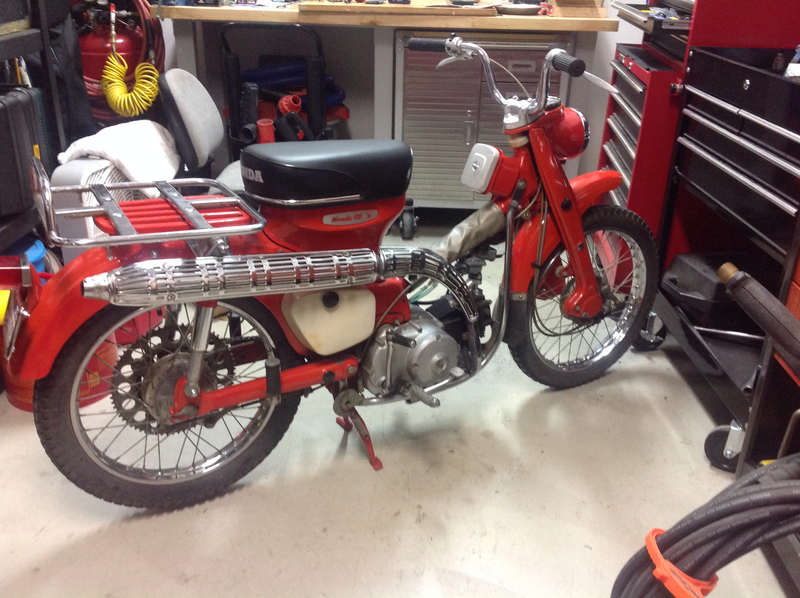 I just picked up a somewhat neglected 1982 Honda Trail 110 (CT110) from a neighbor for $300. This will be a slower build than the KLX450R, so standby for updates! Crisis management Latte riders FTW! Thats a tidy looking CT, I picked up a $20 CT90 a month ago but it has been a farm hack so is in nowhere near the condition yours is in, but with some fresh fuel and an oil change it's running perfectly! It's now in a few hundred pieces getting repainted and all the seals etc being refreshed, total budget is $200 to get it back to being "road legal"..... as long as the police don't take a close look! They are a fun little bike, mine is being assigned to be the beach bike for getting groceries and going fishing at our beach house. I have got a lot of work done since receiving the parts that I ordered. After removing the rusty snap ring I cleaned up the fork tube, replaced the seal & the fork oil. I found the brake cable to be completely seized up so I ordered one from Beatrice Cycle . I also installed a new carb, fuel lines & small, inline fuel filters. After replacing the oil, I got it running but have to tune it as I found that it won't hold it's idle. I bought a seat cover for the main seat & a passenger seat on ebay. I found both the sealed beam headlight and the tail/brake light bulb to be burned out. Ordered the "off road" headlight from Beatrice Cycle that has a replaceable bulb and will be picking up the tail light bulb locally. I also flushed the engine oil with Seafoam and replaced it with Shell Rotella T 5W-40 synthetic. 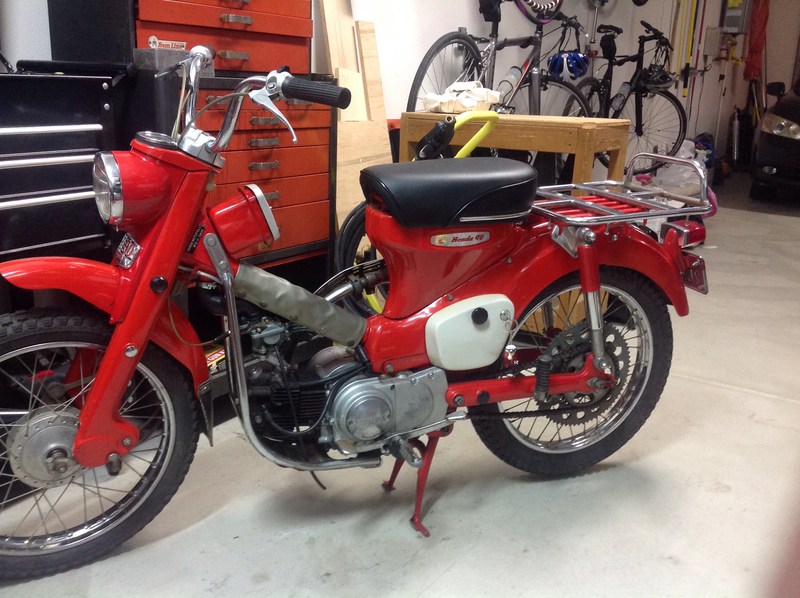 After resetting the initial settings I was able to get the carb/engine tuned & it runs great! I just ordered a Garmin Montana gps mount for the handlebars- will be able to use my Montana 600 on it using the internal battery as it won't run/charge off of the 6 volt system. Very nice work! DrATV (Beatrice Cycle) is the place to go! They get all my spare $$$ too. Question, why the 2nd set of passenger pegs mounted on shock bolts vs. the OEM pegs forward??? At the end of the month I'm heading west (to Cali & up the coast) in my Rv with the CT110 on the back. I plan on using the CT110 when the RV is parked & we need to ride into town. With the extra seat and foot pegs I can get both kids on the CT110 (behind me) for the short ride to town. I forgot to add that I adjusted the valves yesterday- they were way out (loose). Now the only items to address are the new headlight (on it's way) and getting the helmet & frame locks either rekeyed or replaced. As you can see the tree pollen nailed the can, so I finished the later coates in the garage. very nice. I would really like to find one that good for the price you got it for! He made the keys from the code that was on the back of the steering and helmet holder/sub fuel tank locks. I'm just waiting on the crossmember cover & decals to come in. It will be complete after that!